The artist; sold 21 January 1925 to (Paul Rosenberg & Co., Paris); probably sold by Rosenberg & Co. to Dr. Gottlieb Friedrich Reber [1880-1959], Lausanne, by 1930 until at least 1953. Leigh B. [1905-1987] and Mary Lasker [1904-1981] Block, Chicago, by 1962; purchased 10 April 1968 by Taft B. [d. 1976] and Rita [d. 1989] Schreiber, Beverly Hills; bequest 1989 of Rita Schreiber to NGA. Alexandre Rosenberg to Mr. and Mrs. Schreiber, letter, 26 April 1973, in NGA curatorial files. An important collector of Picasso's work, Dr. Reber is listed as owner of the painting in the credit to its reproduction in Documents 2e Année, 3 (1930): repro., and he lent the painting to a Picasso exhibition held in Sao Paulo, Brazil from December 1953 to February 1954. He purchased many of his paintings from Rosenberg & Co. The Blocks owned the painting by the time it was included in a 1962 exhibition in New York. According to Schreiber collection records, in NGA curatorial files. Exposition Picasso, Galerie Georges Petit, Paris, June-July 1932, no. 152. Picasso, Kunsthaus Zurich, September -October 1932, no. 147. Exposiçao Picasso (2nd Biennal), Museu de Arte Moderna de Sao Paulo, Brazil, 1953-1954, no. 15, repro. Picasso, an American Tribute, Paul Rosenberg and Co., New York, 1962, no. 41, repro. (exhibition held simultaneously at 9 New York galleries; "The Twenties" was held at Rosenberg and Co.). One Hundred European Paintings & Drawings from the Collection of Mr. and Mrs. Leigh B. Block, National Gallery of Art, Washington, D.C.; Los Angeles County Museum of Art, 1967, no. 39, repro. One Hundred European Paintings & Drawings from the Collection of Mr. and Mrs. Leigh B. Block, Museum of Fine Arts, Boston, 1968, no. 40, repro. Picasso, Braque, Léger and the Cubist Spirit 1919-1939, Portland Museum of Art, Maine, 1996, no. 57, repro. Picasso y el teatro: Parade, Pulcinella, Cuadro Flamenco, Mercure, Museu Picasso, Barcelona, 1996-1997, no. 184, repro. Picasso e il viaggio in Italia 1917-1924, Palazzo Grassi, Venice, 1998, no. 224, repro. L'École de Paris 1904-1929, la part de l'Autre, Musée d'Art Moderne de la Ville de Paris, 2000-2001, no. 163, repro. Picasso, de la caricatura a las metamorfosis de estilo, Museu Picasso, Barcelona, 2003, no. 124, repro. Picasso and the Circus, Museu Picasso, Barcelona; Fondation Pierre Gianadda, Martigny, 2006-2007, no. 189 (Spanish and French cats. ), repros. 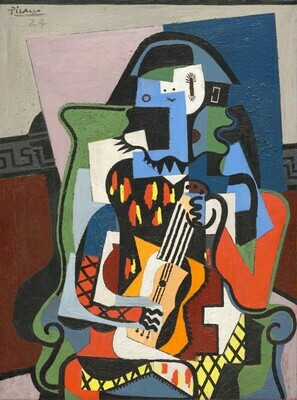 Picasso Harlequin 1917-1937, Complesso del Vittoriano, Rome, 2008-2009, no. 17, repro. Picasso. His First Museum Exhibition 1932, Kunsthaus Zürich, 2010-2011, no. 48, repro. Zervos, Christian. Pablo Picasso. 33 vols. Paris, 1032-1978: 5(1952): no. 328.